The Camarasauromorpha are a clade of sauropod dinosaurs that have been defined as the smallest clade containing Camarasaurus and Saltasaurus (Upchurch et al. 2004). 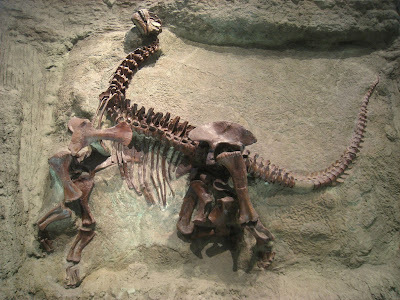 Camarasaurus is the most common sauropod in the Late Jurassic Morrison Formation of North America; it possessed an arched skull and blunt snout. Characters (from Upchurch et al. 2004): Premaxillary ascending process directed dorsally over most of its length; rostral end of splenial reaching mandibular symphysis; pleurocoels in cranial dorsal centra having acute caudal ends; metacarpal I longer than metacarpal IV; length of longest metacarpal at least 40% radius length.